Now that I’m home with Sam during the day, I struggle to find lunch ideas that are simple but still exciting. Because let’s face it — some days I barely have time for a ham sandwich and a handful of grapes, and there’s nothing exciting about that. But I’ve found that if I plan ahead — i.e. make a batch of this Thai chicken salad on Sunday — lunch is something I look forward to. I can assemble it quickly and sit down to savor it while the little guy is napping. This wrap is full of flavor and packed with enough protein and veggies to keep me satisfied until dinner. Do you have any easy and fulfilling lunch ideas to share? Heat olive oil in a skillet over medium-high heat. Sprinkle salt and pepper onto chicken and cook about 4 minutes per side. Slice cooked chicken on an angle. In a large bowl, combine sprouts, coleslaw, scallions, and basil. Set aside. In a small bowl, whisk together peanut butter, soy sauce, vinegar, sugar, and cayenne. Stream in canola oil. Add chicken to veggies and pour peanut sauce on top. Toss to combine. 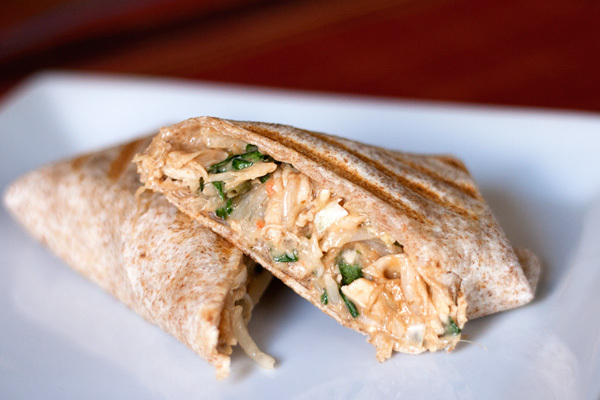 Pile chicken salad onto tortillas, wrap tightly, and warm using a panini press or griddler. This looks so yummy, Emily! This looks so good! I’m guilty of relying on left-overs and soups or salad for lunch most days (could be worse!). I hope you get some good ideas! I usually pick really random leftovers, but if I’m ambitious and cook something quick, I recommend scrambling 2 eggs, throwing in a handful of spinach, and a little bit of feta. Balanced, healthy, enough calories to keep you going, and delicious. This looks good! Question: what’s coleslaw mix? Is it just coleslaw you made ahead of time, or is it something particular you pick up at the grocery store? Yes, you can find coleslaw mix in the produce section of the supermarket. If you can’t find it, you can always shred some cabbage and carrots. Either way, I hope you try this recipe. It’s a great one! Christopher would LOVE this. He is all about the Thai-style and curried chicken salads (or anything for that matter). I really like that there’s no may here, just tons of fresh flavors! I made these tonight and they were wonderful! The only thing I did differently was add a little more of the coleslaw mix since I had so much (I think I added about 2 cups total). Very tasty! Even my husband, who was a little nervous about the bean sprouts, said he’d have them again! I made these recently and they were SO delicious! Thanks for yet another amazing recipe! Just found your blog a few days ago and made these last night – absolutely delish! Thanks for sharing! I made these tonight and they were excellent! I added extra carrot to the coleslaw mix and I baked the chicken with sweet coconut chili sauce on top and then sliced the chicken up. Thanks for the great recipe! I just made these tonight and they did not disappoint! 🙂 Another great recipe from you guys…thank you! Even the recipes for meat dishes look good. I just can’t personally eat it. I used to be a flexitarian (I guess that’s what it’s called now) but recently had to drop it altogether. Chicken was one of the few meats I did eat. Chicken and seafood, and sometimes sausage. I’d like the bean sprouts though.